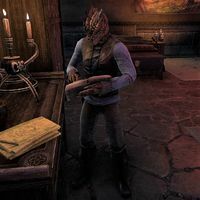 Uralgnaza is an Argonian crafter who can be found at the Vivec City Furnishing in the Canton of St. Delyn the Wise in Vivec City. You'll find him in the lower level sleeping area with Calysa Velain. He has no unique dialogue. This page was last modified on 21 January 2019, at 00:58.